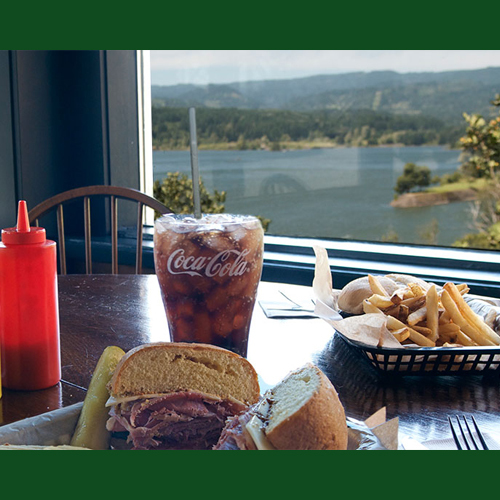 Bask in the beautiful views of the Columbia River Gorge as you enjoy a delicious burger at The Char Burger. This historic dining spot is located right off I-84 so you can stop in on your way to or from your adventures at The Gorge. The Char Burger serves breakfast, lunch and dinner seven days a week. Under new ownership since July, 2013, the Char Burger restaurant has been completely remodeled and updated. The Cascade Locks restaurant retains its historic character and memorabilia. A great eatery for visitors of the Pacific Crest Trail, Historic Columbia River Highway State Trail, Multnomah Falls and other Columbia Gorge waterfalls.